The Union Dallas, a $350 million mixed-use development on the border of Uptown and Victory Park, is almost complete after close to three years of construction. Owned by Phoenix-based RED Development, the high-profile project on the bustling corner of Cedar Springs Road and Field Street is bringing an array of dining options, luxury apartments, office space and a Tom Thumb grocery store to the area. Even with all the shrimp goodness, this dish really is all about the broth … and soaking it up with toasted garlic bread. I bet you can imagine the aroma. I know I can. This recipe comes from the dinner menu at The Henry in a new uptown high rise called The Union. It is one of several concepts in the pantheon of Fox Restaurants, a growing chain that started in Arizona. Flower Child, with several locations in the Dallas area, is another Fox Restaurants brand. How often do you spot North Dallas and Park Cities Ladies Who Lunch venturing anywhere near downtown, except to a luxury department store eatery? There have been sightings at The Henry, a self-styled “neighborhood bistro.” The neighborhood is not precisely downtown or uptown but near Victory Park on the ground floor of a new mixed-use high rise, The Union. Of course, a lot of the crowd during our hosted lunch visit was from nearby office buildings. And there was a birthday party of hair stylists and influencers celebrating at a table near ours. But much of the buzz about this place, full at lunch after only a month in operation, focuses on the rooftop bar. 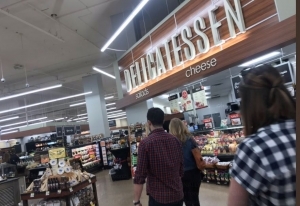 Considering the population density of Uptown and downtown Dallas, it’s surprising that it’s taken so long to get a full-sized grocery store in the area. Sure, there’s a small Whole Foods on McKinney and a Kroger Fresh Fare on Cedar Springs, but otherwise, grocery offerings are limited — and, in the case of Whole Foods and Royal Blue Grocery downtown, are more expensive than the everyday shopper can afford. Uptown grocery shoppers now have a new choice for getting their weekend grocery shopping done. Tom Thumb opened a 56,000-square-foot store Friday in The Union, a $350 million high-rise office, residential, restaurant complex built by RED Development and designed by Dallas-based HKS. To cater to the tower residents paying monthly rents starting at $2,100 — and office workers on their way home — the street-level supermarket and pharmacy is also set up for both deliveries and drive-through pickups. A full service tom thumb grocery store just opened in Downtown Dallas. Connie Yates with Tom Thumb said it’s the first of its kind in the area. It’s located on Field Street, walking distance from many businesses and apartments near The Union. “It’s so accessible for the people in this area because many people walk for lunch or buy their groceries, because a lot of people work and live around here… there’s a lot of foot traffic,” Yates said. There’s a new Tom Thumb store opening near downtown Dallas, and it’ll come with something extra: a bar and restaurant inside. The grocery is opening at 2380 N. Field St., at The Union, the new complex that’s also home to The Henry, Taco Lingo, and a slew of various restaurants to come. Not having a supermarket has been a longtime complaint from the small but growing population of people who live within the Central Business District. I broke the internet with my story about Uptown Dallas’ iconic El Fenix restaurant hitting the market for sale. Who knew so many people cared so much about an old Tex Mex joint? As local landmarks go, you can’t find a more beloved building than the century-old restaurant that has served enough tacos to stretch to the moon and back. The net absorption rate in the Dallas-Fort Worth retail sector hit 722K SF market-wide in the first quarter of 2019, data from commercial real estate firm CBRE shows. The retail occupancy rate remained strong at 94.5% across DFW, while 451K SF of new construction was delivered across the entire Metroplex in Q1. Adding to leasing activity was the 800K SF mixed-use development The Union, in Uptown Dallas, which is about to include major grocery retailer Tom Thumb and seven restaurants situated next to 309 apartments and an office tower. As a diligent diner keeping up on Dallas’ booming restaurant scene, your work is cut out for you. Just when you feel like you’ve caught up with all of the new openings, here come 10 more restaurants, waiting for you to try them out. Luckily, you have 30 days in April. That gives you plenty of time to hit up all the restaurants on this list, all of which have opened within the past month or so. Let the dining begin. A New Downtown Dallas Tom Thumb store opens Friday in a development called ‘The Union’ between Field Street and Harry Hines Boulevard. Neighbors and Downtown Dallas boosters are excited. The store is near the American Airlines Center north of Woodall Rogers Freeway. Instead of suburban-style grocery store parking, this store has a large parking garage under the store.